The 1923 earthquake devastated the Tokyo metropolitan area. 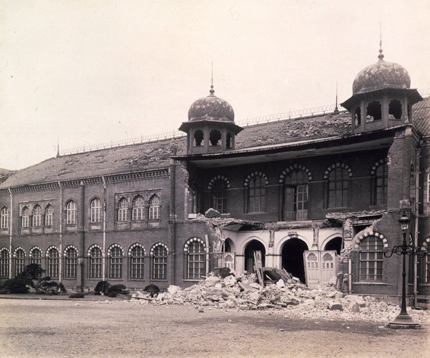 Except for the Hyokeikan, the Museum's buildings (the Honkan, the 1877 brick wing and the reference building built in 1890) were severely damaged and were unable to stay open. 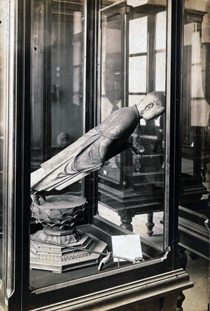 Luckily, many of the items escaped damage and the Museum resumed exhibitions in 1924 using the Hyokeikan. The items included treasures from Horyuji Temple, Sesshu's Haboku Landscape, Koetsu's Writing Box with a Pontoon Bridge, the twelve-guardians statue from Kofukuji Temple, the Kisshoten goddess statue from Joruriji Temple, and the statue of UESUGI Shigefusa from Meigetsuin Temple. In spite of the limited space, the Museum managed to exhibit its many collections together with such famous works on a regular basis. The exhibitions at the Hyokeikan continued until restoration work was completed and the new main building (the present Honkan) opened in 1938. Crown Prince Hirohito (the future Emperor Showa) married in February 1924, and the entire Ueno Park and Zoo were given to the city of Tokyo to commemorate his marriage. The Kyoto Imperial Museum was gifted to the city of Kyoto. As a result, the Museum at Nara and the Shosoin Treasure House in Nara remained as Museum properties. In 1925, the Museum's animal, plant and mineral collections were transferred to the Tokyo Museum (the present National Science Museum), which had been an issue for a long time, and the natural products department was shut down. With two departments remained (history and art), the Museum became to focus on its role as a fine art museum. The Museum began to publish guide books, catalogs, pictorial records, lecture collections, academic bulletins and reproductions of old materials. It also published an annual bulletin to keep the public be acquainted with its activities. From 1928, the restoration project picked up speed and in 1932, construction work on the main building began. The framework was completed in 1936, while the construction of a new wing also got underway. But with the onset of an economic recession and hostilities in Manchuria (the Manchurian Incident), economic and social instability began to affect the Museum. Attendances peaked in 1925 when 250,000 people visited the Museum, but from then on the numbers dropped gradually, and by 1937, the numbers went down to 80,000.